“Girl, he ain’t gonna catch you,” howled the lady in the seat directly behind, not giving a damn about her annoyed surroundings. The narration is for a moment where Dr. Casey Bracket (Olivia Munn), after accidentally tranquilizing her right foot, needs help deboarding the Yautja-immobilized bus she’s on (the roof of) and our lead, Army Ranger Quinn McKenna (Boyd Holbrook), is standing below with both arms stretched out. “Nuh-uh, he ain’t,” the lady continues, her voice warps into the amplifying score and noise. And lo, it happens: Quinn lets the dirt greet Casey just as she jumps. Even though 3/4 of the auditorium are laughing their guts out, the lady’s “Told ya, honey!” is five decibels higher than the rest. But credit where it’s due: The lady, total absence of decorum aside, is still not as embarrassing as what is on-screen. The Shane Black-directed and co-scripted film — Shane. Black. — does everything it can to three-point lasered our interest and, in turn, continually giving the lady a chance to make random statements, ask her friends for a summary (a fella among them is also an up-and-coming in-theater commenter, joy! ), discredit Casey, question Quinn’s intelligence quotient and offer spoken commentary as if we’re watching Discovery Channel made The Predator. The only watchable sequence in The Predator, and the one where the lady stays attentive as a filmgoer should, is the beginning, among the stars where a spaceship (of the Shaq-height Yautja, the one that met Arnold) crash-glides above South America after being chased by a bigger one (of the Mureșan-height Yautja). Afterward it’s a woefully impetuous and muddled chain of events where Quinn — the first to encounter, and loot tech from, the Predator — Casey — she’s been researching the creature — Quinn’s autistic son Rory (Jacob Tremblay, again as an “abnormal” boy!) — who receives the tech after Quinn mails it to his Georgia home and activates it — a troupe full of undesirables — among them the jokester Coyle (Keegan Michael-Key), oft-bullied (since he has Tourette’s!) Baxley (Thomas Jane) and semi-charismatic Gaylord (Trevante Rhodes) — and sinister agent (Sterling K. Brown, whose splendid chords makes his grating introductory line, “They’re large, they’re fast, and f**king you up is their idea of tourism,” tolerable) appear on the Yautja’s to-kill list. Frankly, past Predator films assume a “whatever” attitude to the script; as long as the beast can show its badassery and the body count rises all is well. Black’s involvement, however, much like his brand of subverting preconceptions (for better and worse), suggests the freakish hunter’s outing will have that and a new-but-solid foundation. John McTiernan’s suspense and Black’s love of surprises? How can you not volunteer as trophy, right? Then comes the decloaking that reveals the horror: The advertised “explosive reinvention” vision never shows up as possible golds — the suburbs as a hunting ground, Predator “Bulldogs,” Predator vs. (CGI-heavy Super) Predator, to name a few — are introduced and then traded for actual pebbles — questionable vulgarity, encouragement of infantilism and, most visibly, disorienting structuring — until that’s what the entire bag consists of. The insulting, or humorous, thing here is not that you’ve been lied to (deception is a marketing tactic, heartless as that sounds), it’s that Predator 2 is more engaging than this. Add Predators, too, while we’re at it. Noticeably, a lot of The Predator is on the cutting room floor. Not just the chase with the flipping Humvee in the trailers, but also — being a hopeful creature here — a narrative where the beats of refreshment (or, at least, the minims of a stalked-by-Yautja film) are realized, harmless-and-mindless entertainment is offered, temporal progression is shown and geographical switches are acknowledged. Right now, everything feels pureéd together and effortful to decipher, the latter is rage-inducing when you have Larry Fong as your d.p. Remember that bit with the chasing starships? That’s the only time his lensing skills are honored, otherwise a frame is placed under a turbocharged woodchipper. What’s worse, though, is Harry B. Miller III and Billy Weber’s cutting style turns the film into a high-budgeted propaganda for those who worship the “boys’ club” mentality to use; as regular as the pickings on the disabled are Munn’s character being the epicenter of others’ barbs. One sure hopes it’s accidental that this shows up after the reshoots and however many passes in the editing bay. That Steven Wilder Striegel can be on the set is an already depressing enough matter, you know? Still, every film has an audience, and The Predator certainly has that in the lady in the seat directly behind. Mulling over it now, it seems she is a cognizant individual: The experience is an obnoxious one, and what she is doing that is stating the fact in her distinctive way. Should there be a sequel for this — the ending screams so (such brass) — one hope she’ll be in the audience again, highlighting truth in a time when most struggle to define it. Bless your heart, lady. Bless your freaking heart. And for those involved with the film: If you have a resume, leave this project out. 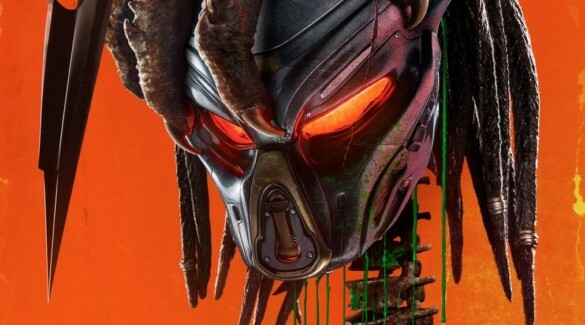 Or retitle it “Yautja Skit.” Or something, as this is far from the Shane Black’s The Predator you’ve signed up for.